“My mother’s uncle, Arthur Slater, was probably born in Barnard Castle, County Durham. Having survived the horrors of the trenches, he was tragically killed in a motorcycle accident in 1919 or 1920. We had always assumed he may have joined a local regiment, such as the Durham Light Infantry, but a search revealed this not to be the case, and the cap badge and belt buckle are not DLI. 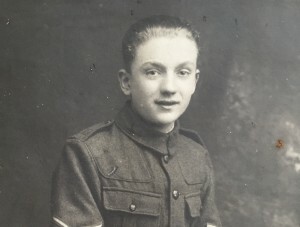 As I’ve commented on Twitter, the cap badge appears to me to be that of the King’s Royal Rifle Corps. That’s also consistent with what I can make out of his shoulder title, which appears to be straight, and the last two letters could be RC. However, I can’t find a medal index card that matches exactly, this one is probably best http://discovery.nationalarchives.gov.uk/details/r/D5192279 but he’s shown only as a private – however, lance corporal was an appointment, rather than a rank during the war, so men are sometimes shown as privates (their substantive rank), rather than as lance corporal. 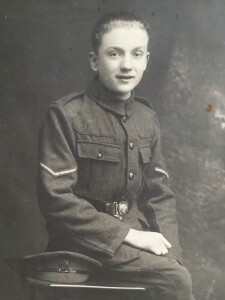 Alternatively, he may only have held the rank of lance corporal while in training, or other service in the UK, and such rank sometimes had to be given up when posted overseas (as it was considered inappropriate to have people with no combat experience being posted into a unit with higher rank I think).